What is Fire | What is Fire? Fire is in a way is hard to define. But, you know it is when you see it, feel it, or see the damage that it can cause if out of control. Many times you will read that fire is the combination of heat, oxygen and fuel in the right proportions to result in a chemical reaction called oxidation. Oxidation is the reaction of oxygen with any other chemical. This reaction can result in a slow chemical reaction such as when iron combines with oxygen and rust forms. Or in the case of a fire the reaction can result in rapid oxidation. In the case of fire, this rapid oxidation may be seen in the form of a flame. A fire can also occur without see a flame as in the case of charcoal slowly burning. Fire resulting in rapid oxidation can also be felt in the form of heat. This heat is formed by the breaking down of molecules in the fuel when combined with oxygen. When you look at the fire triangle, you may think that a lot of heat must be present for a fire to occur. But, this is misleading because some fires start without much heat being present in the area surrounding the are where the fire occurs. Think for a moment about flint being struck and causing a spark. It can be argued that there is a lot of heat formed by the friction of the flint hitting another object. But, everybody would agree that there is no change in the temperature in the area surrounding the flint. To better understand this concept, think about a old flint fired rifle being fired in a freezer. The surrounding area would be freezing but the point of contact would obviously be hot enough to cause combustion. This can also be seen with lighting strike which causes fires. The contact with the lighting and a tree, home or other object can result in combustion of the object. But, it actually may be raining and cool when this chemical reaction occurs. Once combustion takes place then three factors are come into play. These are the three factors from the fire triangle. They are heat, oxygen and fuel. As the fire continues, heat may rise which results in even more rapid oxidation as long as sufficient fuel remains. Another very important factor that is often left our or forgotten is the amount of pressure present in the atmosphere or area surrounding the fuel. The state of matter, whether a substance is in the form of a gas, a solid, or a liquid is determined by several factors including the amount of pressure present. Think of a how a car engine works. This is called a combustion engine. A piston compresses gas under extreme pressure, a spark occurs and this results in an explosion which burns the gasoline present. Without the pressure being present only a small combustion reaction would occur and the car would not move. Ironically, once a fire starts less pressure will result in more oxidation. This is because a fire needs oxygen in order to keep burning. Isolating a fire and cutting off oxygen will result in the extinguishing of the fire. 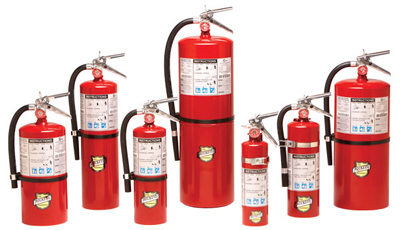 Fire extinguishers function by drastically decreasing amount of heat present or depleting the oxygen present.